Accra, Oct. 27, GNA - An Accra High Court on Wednesday handed down 20 years' imprisonment to each of the six persons it found guilty of smuggling 588.33 kilograms of cocaine into the country, even though, they all pleaded not guilty. Kevin Gorman, 59, an American, Mohammed Ibrahim Kamil, a Ghanaian, John David Logan, 43, Frank Lavelrick, 43, Alan Hodson 45, all British nationals and 45-year-old Sven Herb, a German, faced charges for conspiracy and possessing 588.33 kilograms of cocaine without lawful authority. 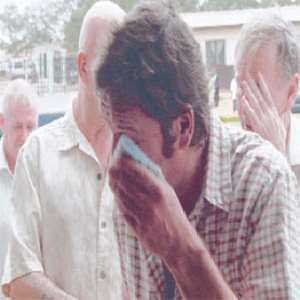 Gorman, Lavelrick and Hodson were additionally charged with importing narcotic drugs without licence from the Ministry of Health. Gorman was further charged with using his property for narcotic offence. The Court presided over by Mr Justice F. Kusi Appiah, a Court of Appeal Judge sitting as additional High Court Judge, found them guilty and convicted them accordingly. The Court ordered that all monies retrieved from the convicts - 18,841 dollars; 1,150 pounds sterling; 9,485 Euros; Venezuelan currencies, 40 Thai dollars, 10 Swiss Francs and 4.2 million cedis - be confiscated to the State. The Court ordered that Gorman's house number 33/7 located at Tema Community 10 and a van used in conveying the drugs from Prampram to the house be confiscated to the State. It said a handbook entitled "Cocaine" should be destroyed before the Registry of the Court. However, a car with registration number GT 1718 S, a revolver and shotgun, which the court found were not connected to the crime, should be returned to them. Reading a 50-page judgement the court stated that considering the quantity of the drugs and modus operandi of the accused persons it ought to mete out sentences to serve as deterrent to others. The Court described them as grandmasters in the drug business. Mr Justice Kusi Appiah stated that on the conspiracy charge, the Prosecution was able to establish a case against the convicts. It said the Prosecution led evidence to show that all the convicts, apart from Kamil, were arrested in Gorman's house. The Court described Gorman as the wheel around which all activities revolved and that Hodson was only not in the country to deliver Gorman's cancer drugs to him but deal in the cocaine business. The Court described Hodson as untruthful as he denied engaging in any masonry work in Gorman's house but Prosecution witnesses had seen him carrying out masonry work and he was the one, who created the compartments. As a result, the Court said, Kamil arrived with Herb in a boat to convey the boxes of cocaine from Prampram Beach to Tema and offloaded it into a van that took it to Gorman's house. It noted that Kamil visited Gorman several times and debunked his assertion that he only arrived in the house to collect a present. The Court was of the view that Logan and Laverick although were engaged in oil business travelled with Gorman to various countries to procure and purchase drugs to be distributed. "I found out that the arrival of Logan and Laverick was pre-arranged and it was in furtherance to see to the arrival of the boxes of cocaine into the country," the Judge said. Mr Justice Kusi Appiah said Hodson and Lavelrick, who told the Court that they wanted to travel to Nigeria before January 9, 2004 for a business transaction, never made any arrangement to that effect. It said the visit of Hodson was not coincidental but was to accomplish a criminal offence. On Herb the Court said it found that he was the one, who conveyed the boxes of the drugs and landed at Prampram Beach. It also found that Herb arrived in Captain's Lodge at Prampram with Kamil and other people to offload the boxes of supposed fish. Herb through Kamil distributed 200,000 cedis each to some Prosecution Witnesses, who assisted in offloading the boxes of cocaine into a van owned by Kamil. The case of the Prosecution was that Gorman is a Director/Shareholder and Operations Manager of a shipping company called Tuna To-Go Limited based in Tema. On January 7, the Narcotics Control Board (NACOB) and the Drug Enforcement Unit (DEU) of the Police Service raided the residence of Gorman and discovered bales and parcels of whitish substances suspected to be cocaine. The parcels were concealed in a specially constructed hole or compartment in a wall behind a large dressing mirror. The Prosecution said Gorman with Logan, Lavelrick and Hodgson, who were living in the house at the time, were confronted with the substance. Gorman said the bales and parcels were brought there for safe keeping by one Yakuba for a fee of 50,000 dollars.